Posted on July 12, 2018 at 2:53 am. Since it can’t be said often enough, we will say it again. Open adoption is a relationship. A key to making any relationship go the distance is communication. The typically overlooked part of communication that sometimes needs tweaking is listening. When conversations get tense, the go to mental response is usually defense. While the other person is talking, we are busy preparing our answer response…from our point of view…to get our point across. And that’s just the words. What we say is based on so much more than words. We are not machines or robots. The words we use are used in a context. Body language, tone of voice, and cadence all play a part in getting the point across. Think about this sentence: “Junior, get out of the street.” Without context, you don’t have any idea what the situation is. If this sentence is being said calmly and slowly, chances are Junior is on a quiet cul-de-sac where there is no traffic. His mom would just prefer he not get in the habit of playing in the street. On the other hand, if this same sentence is said in a rapid, loud, and fast way while the speaker is running into the street at warp speed, it’s a good bet that a two-ton truck is bearing down on Junior with death being imminent. What makes the open adoption relationship tricky sometimes, particularly in the early stages, is that much of the communication comes in the form of texts. Unless the text comes in all caps, it’s hard to gauge the feeling behind the message. While you are building that relationship after placement, (especially IMMEDIATELY after placement) it’s important to realize that emotions are raw. For the birth parent (mother or father) who has just said good-bye to baby, shock, anger or sadness, may be the emotions nearest the surface. For the adoptive parents who may have previously given up hope of ever welcoming a baby into their home, fatigue, joy, or relief may be the emotions nearest the surface. And let’s be honest. For BOTH the birth and adoptive families, fear may be lurking near the emotional surface as well. Fear of having made the wrong decision. Fear of never seeing the baby again. Fear of not being a good parent. Fear of the child someday resenting either set of parents. So when the first communications begin to go back and forth between birth and adoptive families, recognize and honor those emotional back stories. When birth mama asks for a visit and adoptive mama’s first thought is “I haven’t taken a shower in two weeks and can barely keep my eyes open”, an immediate response of “no, this is not a good time” does not do anything to build the relationship. It’s better to take a step back, recognize your own emotions, and then respond by trying to understand the birth family’s emotions behind the request. A reply text that acknowledges the feelings is the way to keep laying the foundation for a long term relationship. A text that says “I bet you are missing baby so much. It’s been crazy busy but let me look at the calendar so we can figure something out” followed by a picture of baby is a caring, genuine response to the emotion behind the request. Likewise, when adoptive an family texts a birth family with an update, it’s a good opportunity for the birth family to recognize the positive emotions the adoptive family may be feeling. Recognizing that in the reply by saying something like “You seem so proud of her! I am so excited to see how big she is getting” reaffirms the decisions made by both the birth and adoptive family. In turn, this contributes to that strong foundation that will carry the open relationship throughout the child’s life. A final thought for today…texts, letters, and electronic messages do help keep people connected. But it’s hard to really listen for the more subtle messages that the human voice conveys. When it comes to long term relationships—like open adoption—don’t rely on texts. Call. Skype. Meet in person. The listening part of communication will only get stronger. Ultimately, your child deserves this…this healthy, honest, and mutual relationship between the most important people in his or her life…their family. Posted on June 14, 2018 at 12:23 pm. Relationships. Are good relationships a math equation? When both sides give 50 percent effort to making the relationship work, it must be a good relationship because 50 + 50 = 100. Oh, just meet me halfway! That’s all I’m asking of you, right? Realistically…good relationships are not math equations. Why not? There are simply too many variables. Time, energy, control, desire, needs, values, goals, personality, chemistry, effort…each of these variables can come into play in a relationship at any given time on any given side. Whether it’s a friendship, a romance, a working relationship, or an adoption relationship, what makes the relationship work depends on any or all of those attributes. And the mixture of these elements can change from day to day, hour to hour. What does this have to do with open adoption? It can’t be said enough. Open adoption is all about relationships. It IS relationships. It is the relationship between adoptive parents and birth parents. It is the relationship between adoptive parents and their children. It is the relationship between birth parents and the children they have placed for adoption. It is not only about keeping in contact, although keeping in contact is certainly an element of open adoption. The thing is, if contact is the only variable in these open adoption relationships, they start to look like those math equations. Isn’t that what keeping score becomes? Adoptive parent first texts birth parent, and if birth parent does not respond, adoptive parent does not believe any further effort needs to go into reaching out to birth parent. So what is wrong with that? Potentially many things. Birth parent may not have the time to respond when the text first comes in. Or she may be having a rough day and can’t emotionally bring herself to respond. Or is afraid to respond at that time. In the interest of healthy open adoptions that foster confidence and love between the children placed for adoption and their birth families, the adoptive parents should get out of the score keeping, math equation type of relationship. Send those texts, even if there is no response! Stop only if the birth family specifically asks for that to stop. Have letters and hard copies of photos ready to send, even if the birth mother’s address is not current. Someday your child will be happy to see that you loved his birth family enough to share his life. Offer a specific date for a visit and be willing to be flexible. Don’t wait for your child’s birth family to ask! Not even if it is the birth family’s “turn” to make arrangements. Not even if it is tiring for you to be the one to always be the contact initiator. Score keeping math equations? Or healthy relationships? Posted on May 31, 2018 at 3:32 pm. Everyone knows that pregnancy lasts for nine months. The emotional waiting time is different for those involved adoption. For the potential adoptive family there are no visible signs of pregnancy. There is the uncertainty of not only the baby’s birth, but what will happen after the birth. Will there be a baby coming home with them or not? For the expectant parents, the emotional waiting time is complicated. Preparing to give birth and preparing to say good-bye all at the same time is not for the weak-hearted. No one can predict with 100% accuracy how they will handle any given situation until they have been in that situation. For everyone involved in the waiting game, there are just as many people on the sidelines who also want to know what is going on. They want to know the timelines too! Is the baby here yet? Do you think the expectant mom is going to follow the adoption plan? Will she be ok if she does? Are the adoptive parents ready? Have you all met each other? All this brings up another question, and that is—do you answer these questions? And if you do, how many times do you have to answer them? Does everyone you know deserve to be in on the action? Do you record your answer to the most frequently asked questions then just hit “play” when one of these comes up? While those pre-recorded answers might be nice, another way handle them is to create your circle of support. The people in this circle are those who care about you and have your back. Face it, not everyone deserves to know all about your business. Once you have determined who is in your circle, create a group text or email chain. Let these people know they will have answers as you are ready to share them. Send out the information on your time table. And for those who don’t make the circle, be ready with your “mind your own business” answer. A simple “I’m not ready to talk about that” or some variation of this should be enough. The forty weeks of pregnancy is a long time to wait. The unknown amount of time for adoptive families is a long time to wait. Make the wait more bearable by sharing what needs to be shared with the people you know, trust, and love because you know they trust, respect, and love you right back. What do you think when you hear the word adoption? Posted on May 24, 2018 at 12:55 pm. Adoption is one of those topics that everyone—yes, everyone—seems to have an opinion and story to share. There are the people who know and want to share adoption horror stories. You’ve probably heard the stories of expectant parents who scam desperate couples out of tens thousands of dollars. Or the stories of adoptees who become psychopathic murderers. Or the stories of abusive adoptive parents who are more interested in having a servant than a child. No matter what side of the adoption triad is being discussed, someone is ready to rain on the parade with a terrifying tale of adoption gone wrong. Then there’s the flip side of the horror stories…tales of sunshine and lollipops. In these stories, the adoptees are perfect and become big stars and never cause their parents a minute of worry. The adoptive parents, with big homes and bigger hearts, make parenting look like a walk in the park. They never struggle, they never doubt, and they have the perfect answer to every question their child asks. Birth parents? In the tales of sunshine and lollipops, the birth parents make a brief walk on appearance, tearfully kiss their baby good-bye, and then conveniently disappear into the sunset. How do you react when you see a story about adoption in the news or on the cover of People magazine? Do you ever stop to wonder why this story is even being published? Most of the time, these stories are meant to tug on the heartstrings. Tugged heartstrings are good for ratings and sales. Is there anything wrong having your heartstrings tugged? No, not necessarily. But if your entire perspective of a situation is based solely on emotion, you may not be dealing with the entire story. And when it comes to adoption, there are real people involved. These real people have feelings, thoughts, and lives that go on beyond the event of adoption. So when you hear the latest news about another celebrity adopting a baby, it’s ok to be happy for that celebrity. It’s also ok to think about that baby’s birth family—and recognize that the celebrity’s joy comes at the expense of a birth family’s grief. For another perspective, it’s ok to recognize and celebrate that the baby will be afforded every advantage in life. Yet that child does not get to have what most of us take for granted…knowing and being raised by the people who gave us life. Posted on May 16, 2018 at 10:00 am. As a society, we tend to throw around words that then become labels. Words serve as codes and conjure pictures in our minds. These pictures then shape our attitudes. Attitudes become beliefs. And these beliefs are what we pass on to our children. Here at ASC we have long advocated for the use of positive adoption language. Positive language serves to remove both stereotypes and judgements. For example—to say a woman gave up her baby evokes a pictures of an uncaring woman who just quits. She quits being a mother. She quits caring for her child. She is then deemed a quitter. This is negative language at its worst. Positive language says a woman placed her child for adoption. She made an adoption plan. The picture that comes to mind shows a woman with purpose and intent. Far from being a quitter, this woman is choosing and acting in a way that provides love, care, and stability for her child. The use of positive language for your child’s story may involve more than just those things related solely to adoption. There may be pieces to your child’s story that involve birth parents who use drugs, have mental illness, or are in the United States illegally. It can be easy to use that shorthand and refer to the birth parents as addicts, or crazies, or illegals. What will your child think of their birth parent if this is how you think of them? 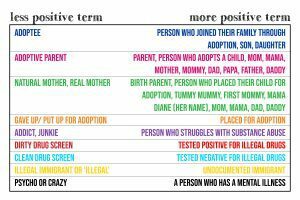 Here’s a quick guide to positive language for situations that may apply to your child’s adoption story. While not all the words on the left are negative in and of themselves, they should be used with caution. Don’t let the “less positive” become just a label! As you wonder who your child’s birth parents will be, or wonder how your child’s birth family is doing now after the placement, practice using the more positive language. If you slip up, give yourself some grace. Just keep on going. This is not an all inclusive list—if you’ve got a term or phrase to share, just let us know! Posted on May 9, 2018 at 8:00 am. Mother’s Day is one of those holidays that retailers love, but a portion of women dread. If you have experienced fertility problems or had a miscarriage or a still birth, Mother’s Day can be a reminder of significant loss. If you have placed a child for adoption, you may feel as if you have no claim to Mother’s Day at all—it’s simply something else that the adoptive mother gets that you miss out on. The “mother” of Mother’s Day never intended for this day to become so commercialized. Anna Jarvis began advocating for a national day or recognition for mothers in the early 1900’s, and in 1908 held the first official celebration in West Virginia. She lobbied for greater recognition and acceptance of this day, and in 1914, President Woodrow Wilson established the second Sunday in May as Mother’s Day. But she was a proponent of the sentiments of love and gratitude to be shown to mothers—not that any type of company use the day for profit. Rather than sending store bought cards, she believed a mother would best be honored with a hand-written, heart-felt note. Based on the actions of Miss Jarvis later in her in life, it is doubtful she would have wanted any woman to feel slighted or uncomfortable or sad on that Sunday. She never had children herself, and she died completely destitute from her efforts to have the holiday removed from the national calendar. So how are you celebrating Mother’s Day? Are you taking your mother out to eat? Men, are you giving your children’s mother flowers and candy? Do you all have your brunch reservations made? More personally, are you going to focus on your losses rather than celebrating the love women have for their children? However you choose to celebrate Mother’s Day, remember the story of Anna Jarvis. Whether you are a waiting mother-to-be, a birth mother, an adoptive mother, a foster mother, or someone who mentors someone along the way…think love and gratitude—and then go out and show the world the same. Posted on May 3, 2018 at 5:30 pm. Defining what an “open adoption” is can be tricky. It’s that little word “open” that seems to cause all the confusion. Does open mean both adoptive and birth parents share the care taking responsibilities of the child? Does it mean the birth family comes to all the child’s events—soccer games, birthday parties, and dance recitals? Does it mean the birth family is able to drop in on the adoptive family anytime they would like? Does it mean only that the child knows their adoption story and the names of their birth parents? Or is it somewhere in the midst of all these things? The problem with definitions is that all too often definitions come with rules. For example, if open adoption for one family means the adoptive parents promise to send monthly updates and photos, as long as they are doing this, they believe they are upholding their end of the bargain. If the birth mother asks for a visit, the adoptive family may believe they are justified in denying this request because it is not what they agreed to do. Maybe it would be more helpful to look at open adoption less as a definition and more as a relationship. And it’s not one relationship, it’s many relationships! There is the relationship you have with your child and the relationship your child has with you. There are the relationships you and your child have with extended family members. And also of great importance, there is the relationship between you and your child’s birth family. All relationships that work well take time and effort to nurture. The initial stages of a relationship are fueled by excitement and possibility. It’s as time goes on that prove if the relationship will survive the differences and troubles that are certain to come. That’s why traditional marriage vows include these familiar words, “for better, for worse, for richer, for poorer, in sickness and in health, to love and to cherish, till death do us part.” What would happen if you gave the same consideration to your child’s birth parents? Could make similar promises? As your relationship with your child’s birth family grows, you will want to celebrate the joys—the “betters”. And the worse will come along—maybe you will lose contact with your child’s birth family. Maybe you will remain in contact, but your child’s birth parents find themselves incarcerated or moving across the country. Remember, your child’s birth parents chose adoption because at that moment in time, they did not believe they could give the care your child deserved to your child. Time will change. Your child’s birth family may encounter great successes and great setbacks. You may encounter great successes and great setbacks. As will your child! Are you ready for an open adoption? Are you ready to love a child for better or worse, for richer for poorer, in sickness and in health? And are you ready to love your child’s birth family in the same way…because they are also a part of your child? If so—then welcome to adoption! Posted on April 25, 2018 at 11:00 am. It’s quite common to hear people voicing their prayers, asking for prayers, and sending thoughts and prayers. Whether it’s from the pulpit of a church or a shared post on Facebook, it seems as though prayer is pervading every part of our lives. Those associated with the world of adoption hear prayer requests all the time. Even those who do not think of themselves as religious or even particularly spiritual seem to both seek and offer prayer when an adoption situation is mentioned. So, if you are praying for an adoption situation, what exactly are you praying for? But wait! Is there anything wrong with asking an adoption go smoothly? Is there anything wrong with praying for the birth parents to sign a consent, for a healthy baby, for the storybook ending? Maybe not. Yet maybe there is something truly limiting in this type of prayer. What about prayers for the woman who has just given birth? Even more challenging, what about prayers for the woman whose children just entered foster care? How about praying for the extended biological family of that baby who are losing their chance to be grandparents, aunts, uncles and cousins? Where do the siblings of the baby fit in? Is a prayer for your happiness and ease all that matters? It has been said that prayer is a conversation. There are always two parts to any conversation—speaking and listening. The speaking comes easily. The listening often takes more work. And in an emotionally charged situation, like adoption, the listening gets crowded out by our own wants, hopes, and dreams. When you ask or are asked for prayers regarding an adoption, pray for strength and peace for the birth family, and for joy in the life of the baby. And then be prepared to listen—even if it’s an answer you don’t like. Listen to the voice inside that says you were meant a part of this other family’s story, for just a little bit. Listen to the voice that says you made this woman’s last part of pregnancy a little easier. Listen to the voice that says your example showed her children they have value and worth. When you do get to bring your baby home, don’t let the prayer conversation end. Let the prayers you speak reflect gratitude. And let the prayers you hear result in actions that show the world that same gratitude.